One thing that I love about the Adelaide Fringe Festival is that it gives opportunities to the smaller avant-garde companies to show us their stuff . You see, I am the kind of girl who likes to go outside the "garden", traipse through the transformed laneways and alternative venues that are oh so cool and then make a spontaneous punt on whatever is going on there and then. Almost all of the Fringe venues have a dynamic vibe and you simply feel good upon entering these places. The Holden St Theatres is one of these gems and they are showcasing some pretty brilliant stuff again this year. The King in Exile is one such success. Why? Well, first of all, the director hopes that the show will not only entertain but make you fall in love with theatre again and it does. It really does. I walked away from last night's performance remembering why I get out and go to a show and what makes a great one! Thanks. King, played by Thomas Kay, is captivating. He and the other equally talented actors do a brilliant job holding on to the audience and bringing them along for this erratic and sometimes confronting journey. The themes covered in this short play by Bradley Klendo include trying to find where you fit in, whether in migration, sexuality or simply in life. The set was ridiculously simple yet they needed nothing to create a truly enjoyable performance. I felt sympathy for the character Rob, understood the frustration and confusion displayed by King and the playwright, was annoyed by the antagonist, aroused and disgusted a little by Jacqueline and had compassion for the Arab and his plight. The witches added to the absurdity of it all. I think that evoking emotions is what a good play should do. Was I entertained? Absolutely? Was it thought provoking? Hell, yes! Was it off the wall? Sure. My hat goes off to the Director, Vlady T., cast and company, Nice Productions for a great show. 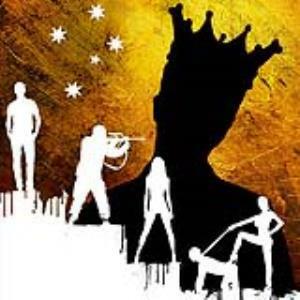 King in Exile runs at The Studio at Holden St. Theatres from now til Feb 22 excluding Monday, Feb 16. Tickets are $23 adult, $17 concession, $12 Bank SA customer and $13 on Tuesdays for everyone! Enjoy! Why? Entertaining and thought provoking!